Lesson 5: U6, Session 2.6 - Assessment: How Many More? Day 1: Understand the problem and solve. Day 2: Look at student work samples. "What do you notice about how ____ organized her work? What do you understand from looking at her work? What new ideas do you have about improving your work?" Have students spend a large chunk of time revising their work. The sum of two numbers is 20. What might the two numbers be? Show all the different possible solutions. What tools might help you solve this problem? How will you organize your work? Students work with a visual model (10 x 10 grid) of numbers to represent and add 2-digit numbers. 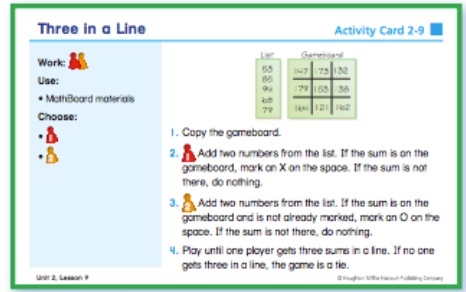 They also connect the grid model to the number line. Students solve sticker story problems that involve adding 2-digit numbers. Students play another version of Roll a Square and have the opportunity to make their own game board. U6, Session 2.6 - Assessment: How Many More?